The Law on the National Common Language and Characters is a product of the 1949 language reforms on mainland China, which designated simplified written Chinese and the Mandarin dialect as the country’s official language and established a phonetic alphabet. The language reform had several consequences. Initially, the government hoped that language reform would build a sense of national unity in a country with eight major dialects. Then and now, the government sought to bolster literacy rates with the goal of promoting an educated workforce and reforming what was considered an elitist educational system prior to the revolution. Over a fifty-year span following the communist takeover, the national literacy rate rose from twenty percent to eighty-five percent, and continues to rise today. The rules governing language in China, and the political agenda of national unification that they carry with them, have encountered resistance as well. Hong Kong and Taiwan have retained traditional Chinese characters as a symbol of their political and ideological distance from mainland China. The reforms have also encountered obstacles in Tibet. In 2010, thousands of Tibetan students gathered to protest new regulations requiring Mandarin Chinese to be taught in the classroom. Tibetans saw it as an attack against their native language, which is already threatened. Xinhua, China’s main news source, argued that the new approach was not aimed to limit Tibetan, but to help students develop a greater command of their native language skills, as well as that of the national language. Christopher Bodeen, China Defends Language Policies in Tibetan Areas, Boston.com, October 23, 2010; Stephen Evans (2010) Language in Transitional Hong Kong: Perspectives from the Public and Private Sectors, Journal of Multilingual and Multicultural Development 31 (4): 347-63; Tedd Plafker, China’s Long – but Uneven – March to Literacy, The New York Times, February 12, 2001; and E. Marcia Sheridan (1981) Literacy and Language Reform in the People’s Republic of China, The Reading Teacher 34 (7): 804-08. The couples in this picture may only be allowed to have one child as a result of China’s One-Child Policy. Established by Chinese leader Deng Xiaoping in 1979, the policy consists of a set of rules governing the approved size of families, including restrictions on the number of children, promotion of late marriage and late childbearing, and, in cases where second children are allowed, regulation of the time between births. These rules mostly apply to ethnic Han Chinese couples in urban areas. Exceptions are often made for rural couples, ethnic minorities, parents without siblings, and families in which the first child has a disability or the parents work in high-risk occupations. Underlying the policy is a system of rewards and penalties given out at the discretion of local officials. Rewards include economic incentives and longer maternity leave, while the penalties for noncompliance include substantial fines, confiscation of belongings, and dismissal from work. Therese Hesketh, Li Lu, and Zhu Wei Xing (2005) The Effect of China’s One-Child Family Policy after 25 Years, New England Journal of Medicine 353: 1171-76; Therese Hesketh and Wei Xing Zhu (1997) Health in China: The One Child Family Policy: The Good, the Bad, and the Ugly, BMJ (British Medical Journal) 314 (7095): 1685–87; and Laura Fitzpatrick, A Brief History of China’s One-Child Policy, Time Magazine, July 27, 2009. This sewer water may be filled with chemicals disallowed in China due to spotty enforcement of laws by Chinese environmental protection bureaus (EPBs). The most powerful Chinese EPB is the Ministry of Environmental Protection. However, most environmental laws are enforced by EPBs at the local level and with local funding. These local agencies have “much discretion in deciding whether and how to enforce environmental rules,” according to Xiaoying and Ortolano. The regulatory style is one of mutual accommodation: Regulators often negotiate fines with companies rather than use a set formula and ten toward mediation of disputes, rather than court action. Stefanie Beyer (2006) Environmental Law and Policy in the People’s Republic of China, Chinese Journal of International Law 5(1): 185-211; Fang, Chak K Chan, and Xiaohong Yang (2008) Managing Air Quality in a Rapidly Developing Nation: China, Atmospheric Environment 43 (1): 79-86; Xiaoying Ma and Leonard Ortolano, eds., Environmental Regulation in China, Rowman & Littlefield Publ., Oxford University Press, New York, 2000; and Shui-Yan Tang, Carlos Wing-Hung Lo and Gerald E. Fryxell (2010) Governance Reform, External Support, and Environmental Regulation Enforcement in Rural China: The Case of Guangdong Province, Journal of Environmental Management 91 (10): 2008-18. An international treaty, the 1972 Convention Concerning the Protection of World Natural and Cultural Heritage, encourages the preservation of outstanding sites for the benefit of current and future generations. The city of Pingyao, featured in this photograph, received designation as a World Heritage Site by UNESCO in 1997. Pingyao is especially noteworthy for its ancient city wall, city tower, and temples. To preserve the city’s cultural artifacts, the Chinese government has put in place rules requiring entrance fees and the elimination many local activities from the central tourist area. While promoting historical preservation, these rules have also disrupted local culture and lifestyles. 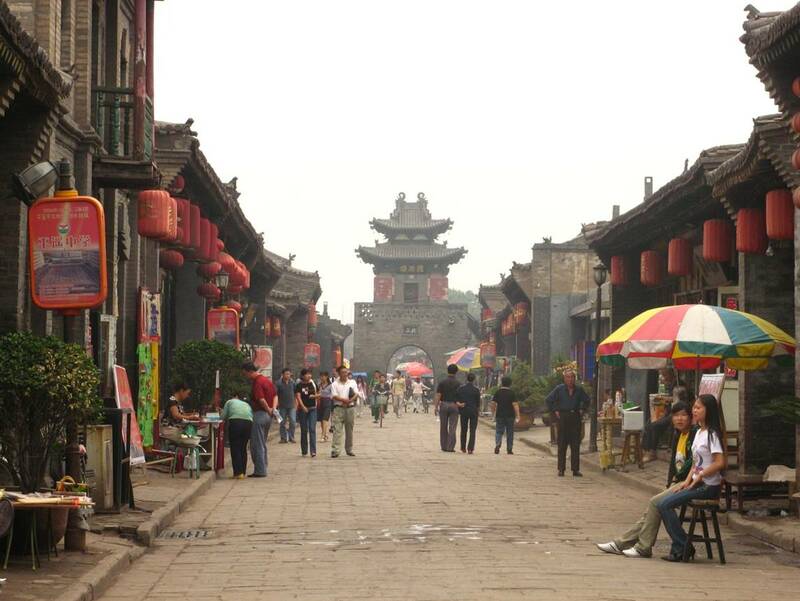 The government argues that the design and infrastructure of Pingyao prevents it from providing significant economic contributions beyond tourism. David Airey and King Chong (2009) National Policy-Makers For Tourism in China, Annals of Tourism Research 37(2): 295-314; Mimi Li, Bihu Wu, and Liping Cai (2008) Tourism Development of World Heritage Sites in China: A Geographic Perspective, Tourism Management 29(2): 308-19; Jie Wen (1998) Evaluation of Tourism and Tourist Resources in China: Existing Methods and Their Limitations, International Journal of Social Economics 25 (2-4): 467-85; and Shu-yi Wang (2011) In Search of Authenticity in Historic Cities in Transformation: The Case Study of Pingyao, China, Journal of Tourism and Cultural Change 9(1): 18-30. In 2005 the Chinese government launched the New Rural Cooperative Medical Care System to provide health insurance to rural people and to create government-run clinics to compete with private hospitals. Eighty percent of rural residents are covered under this health care plan. They pay only 20 percent of the cost, with the rest covered by local and national governments. The plan covers 70 to 80 percent of the cost of a clinic visit in a rural area, but only 30 percent of the cost at a city hospital, encouraging citizens to use their local facilities. The community health centers are not run for profit. To control costs, the government provides each clinic with a fixed payment per year. Fees for services rendered go not to the clinic, but back to the government. This discourages clinics from over-diagnosing simply to earn a profit. The efficacy of this program has yet to be documented, but now millions more rural Chinese possess at least some kind of health care plan. R.E. Ling, F. Liu, X.Q. Lu and W. Wang (2010) Emerging Issues in Public Health: A Perspective in China’s Healthcare System, Public Health 125(1): 9-14. Acid Rain Control Zones have been designated to reduce air pollution. The city of Pingyao is located in Shanxi province, China’s top coal producing region, and suffers from significant air pollution. The Chinese government has designated Acid Rain Control Zones to address the growing threat. After China’s market reforms were launched by Deng Xiaoping, foreign firms poured into the country to take advantage of inexpensive labor and production costs. China’s growing population also contributed to high demand for industrial and agricultural production. As a result of these rapid developments, sulfur dioxide emissions associated with energy production and industry rapidly increased, emitting harmful pollution in the atmosphere. Within a ten-year period after the economic reforms began, the area experiencing acid rain increased by over one million square kilometers. The Chinese government is attempting to reduce sulfur dioxide emissions by 20 percent relative to 1995 levels in the Acid Rain Control Zones. Measures include locating coal-burning power plants away from cities, a ban on high-sulfur coal mines, and a phase out process to replace existing mines with those producing coal with a one percent sulfur content or less. To incentivize the switch to lower sulfur emissions, a tax is levied on each ton of sulfur dioxide produced. This market-based regulatory approach initially proved ineffective, however, because the tax was less expensive than the cost of desulfurization devices or higher-quality coal. Although China has a long way to go in controlling air pollution, the new rules have led to some improvements. Shinsuke Tanaka of Boston University estimates that Chinese regulations have prevented 25,400 premature deaths among children. Thorjørn Larssen et al. (2006) Acid Rain in China, Environmental Science & Technology 40 (2): 418-25; Wei Li and Jixi Gao (2002) Acid Deposition and Integrated Zoning Control in China, Environmental Management 30 (2):169-82; Shinsuke Tanaka, Air Pollution, Infant Mortality, and the Environmental Regulations in China, Boston University, October 2010; and China Economic Review, China Business Guide 2005, Wanchai, Hong Kong, 2004. Chinese laws are promoting the transition to renewable energy sources to power systems such as the street lights in this picture. The Law of Renewable Energy, passed in 2005, is one of a number of rules that the government has put in place with the goal of reducing average energy intensity (energy use per economic output). According to Zhao and Ortolando, “Energy conservation is one of China’s fundamental state policies.” In 2006, the central government issued rules mandating that provincial governments facilitate a 20 percent reduction in energy intensity by 2010. China’s central government holds local officials accountable through “responsibility contracts” – an elaborate system of evaluation paired with rewards and sanctions. Energy conservation has now been included in these responsibility contracts for the first time. Mayors and local magistrates must meet specific conservation targets; these officials, in turn, craft responsibility contracts with specific power companies and energy-intensive industries. If local officials fail to meet the conservation targets, they face a variety of sanctions from Beijing, including the suspension of all new energy projects. Notwithstanding the ambitious goals and strong enforcement measures, many local governments have ignored the new conservation directives. Following decentralization reforms in China, local governments have assumed greater responsibility for providing their citizens with services, but they often lack sufficient tax revenues for meeting their new responsibilities. Pressure to generate tax revenue has increased local corruption and favoritism toward the interests of local businesses. When these businesses prefer traditional energy sources, governments have often met their demands rather than comply with directives from Beijing. Xiaofan Zhao and Leonard Ortolano (2010) Implementing China’s National Energy Conservation Policies at State-owned Electric Power Generation Plants, Energy Policy 38 (10): 6293–6306; and Wang Lisheng, Zhang Peidong, Shi jin, Li Xinrong, Yang Yanli, and Zheng Yonghong (2009) Opportunities and Challenges for Renewable Energy Policy in China, Renewable and Sustainable Energy Reviews 13: 439–49. If they go into an Internet cafe and search for information about human rights, democracy, or freedom, they will often receive an error message such as “This item contains forbidden speech.” The Chinese government requires Internet cafes to keep a record of any user’s visited sites for 60 days. Tech-savvy users can get around these restrictions, but news sources are limited to news outlets approved by the government. By 2008, China had the largest number of Internet users in the world, but these users are limited by what Liang calls the “great firewall of China.” International networks are required to pass through “gateways” in Shanghai, Beijing and Guangzhou, where they can be censored by the government or required to self-censor. Google and Microsoft have agreed to self-censorship as a precondition for working in China, signing the Public Pledge on Self-Discipline for the China Internet Industry. China’s Internet policy is one of “guarded openness.” According to Zhao, the government understands the economic advantages of the Internet, but believes it may be a “harmful influence…upon social values and national integrity.” Thus, Internet censorship plays an important role in maintaining one-party rule and quashing dissent. Bin Liang (2010) Internet Development, Censorship and Cyber Crimes in China, Journal of Contemporary Criminal Justice 26 (1): 103-20; Jinqiu Zhao, A Snapshot of Internet Regulation in Contemporary China: Censorship, Profitability, and Responsibility, pp. 141-51 in Friederike Assandri and Dora Martins (eds. ), From Early Tang Court Debates to China’s Peaceful Rise, Amsterdam University Press, Amsterdam, 2009; and William Thatcher Dowell (2006) The Internet, Censorship and China, Georgetown Journal of International Affairs 6: 111-19. If the man in this picture immigrated to Pingyao, he must apply for the city’s hukou registration. Billed by some as “China’s apartheid,” the hukou designates every citizen as either rural or urban. These designations severely restrict rural-to-urban migration by the Chinese poor who seek a better life in cities. The 800 million Chinese with a rural hukou designation are denied the right to work in the city except in jobs that are, according to Buckingham and Chan, “dirty, dangerous or very low-paying.” Rural citizens can apply for urban hukou status, but these permits are often given preferentially to wealthy or well-educated citizens. Residents with rural hukou status have no access to health care or education for their children in the cities to which they have migrated. They often live in sub-standard dormitories and receive far less pay. These migrants (mingong) are in effect second-class citizens. Reforms to the system introduced in 1992 have done little to dismantle the basic pattern of discrimination. Buckingham, Will and Kam Wing Chan (2008) Is China Abolishing the Hukou System?, The China Quarterly 195: 582-606; and Zhigang Lu and Shunfeng Song (2006) Rural-urban Migration and Wage Determination: The case of Tianjin, China, China Economic Review 17(3): 337-45.